The Fire of Rome, by Karl von Piloty, 1861. According to Tacitus, Nero targeted Christians as those responsible for the fire. The Roman historian and senator Tacitus referred to Christ, his execution by Pontius Pilate, and the existence of early Christians in Rome in one page of his final work, Annals (written ca. AD 116), book 15, chapter 44. The context of the passage is the six-day Great Fire of Rome that burned much of the city in AD 64 during the reign of Roman Emperor Nero. The passage is one of the earliest non-Christian references to the origins of Christianity, the execution of Christ described in the canonical gospels, and the presence and persecution of Christians in 1st-century Rome. Scholars generally consider Tacitus' reference to the execution of Jesus by Pontius Pilate to be both authentic, and of historical value as an independent Roman source. Eddy and Boyd state that it is now "firmly established" that Tacitus provides a non-Christian confirmation of the crucifixion of Jesus. Historian Ronald Mellor has stated that the Annals is "Tacitus's crowning achievement" which represents the "pinnacle of Roman historical writing". Scholars view it as establishing three separate facts about Rome around AD 60: (i) that there were a sizable number of Christians in Rome at the time, (ii) that it was possible to distinguish between Christians and Jews in Rome, and (iii) that at the time pagans made a connection between Christianity in Rome and its origin in Roman Judea. The Annals passage (15.44), which has been subjected to much scholarly analysis, follows a description of the six-day Great Fire of Rome that burned much of Rome in July 64 AD. Consequently, to get rid of the report, Nero fastened the guilt and inflicted the most exquisite tortures on a class hated for their abominations, called Christians by the populace. Christus, from whom the name had its origin, suffered the extreme penalty during the reign of Tiberius at the hands of one of our procurators, Pontius Pilatus, and a most mischievous superstition, thus checked for the moment, again broke out not only in Judæa, the first source of the evil, but even in Rome, where all things hideous and shameful from every part of the world find their centre and become popular. Accordingly, an arrest was first made of all who pleaded guilty; then, upon their information, an immense multitude was convicted, not so much of the crime of firing the city, as of hatred against mankind. Tacitus then describes the torture of Christians. The exact cause of the fire remains uncertain, but much of the population of Rome suspected that Emperor Nero had started the fire himself. 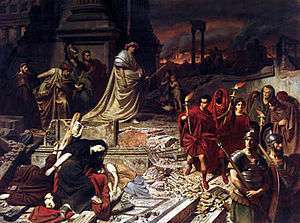 To divert attention from himself, Nero accused the Christians of starting the fire and persecuted them, making this the first documented confrontation between Christians and the authorities in Rome. Tacitus never accused Nero of playing the lyre while Rome burned – that statement came from Cassius Dio, who died in the 3rd century. But Tacitus did suggest that Nero used the Christians as scapegoats. No original manuscripts of the Annals exist and the surviving copies of Tacitus' works derive from two principal manuscripts, known as the Medicean manuscripts, written in Latin, which are held in the Laurentian Library in Florence, Italy. It is the second Medicean manuscript, 11th century and from the Benedictine abbey at Monte Cassino, which is the oldest surviving copy of the passage describing Christians. Scholars generally agree that these copies were written at Monte Cassino and the end of the document refers to Abbas Raynaldus cu... who was most probably one of the two abbots of that name at the abbey during that period. Detail of the 11th century copy of Annals, the gap between the 'i' and 's' is highlighted in the word 'Christianos'. In 1902 Georg Andresen commented on the appearance of the first 'i' and subsequent gap in the earliest extant, 11th century, copy of the Annals in Florence, suggesting that the text had been altered, and an 'e' had originally been in the text, rather than this 'i'. "With ultra-violet examination of the MS the alteration was conclusively shown. It is impossible today to say who altered the letter e into an i. In Suetonius’ Nero 16.2, "christiani", however, seems to be the original reading". 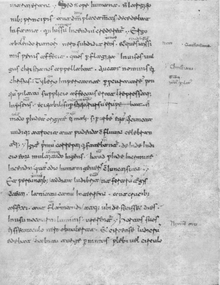 Since the alteration became known it has given rise to debates among scholars as to whether Tacitus deliberately used the term "Chrestians", or if a scribe made an error during the Middle Ages. It has been stated that both the terms Christians and Chrestians had at times been used by the general population in Rome to refer to early Christians. Robert Van Voorst states that many sources indicate that the term Chrestians was also used among the early followers of Jesus by the second century. The term Christians appears only three times in the New Testament, the first usage (Acts 11:26) giving the origin of the term. In all three cases the uncorrected Codex Sinaiticus in Greek reads Chrestianoi. In Phrygia a number of funerary stone inscriptions use the term Chrestians, with one stone inscription using both terms together, reading: "Chrestians for Christians". Adolf von Harnack argued that Chrestians was the original wording, and that Tacitus deliberately used Christus immediately after it to show his own superior knowledge compared to the population at large. Robert Renehan has stated that it was natural for a Roman to mix the two words that sounded the same, that Chrestianos was the original word in the Annals and not an error by a scribe. Van Voorst has stated that it was unlikely for Tacitus himself to refer to Christians as Chrestianos i.e. "useful ones" given that he also referred to them as "hated for their shameful acts". Paul Eddy sees no major impact on the authenticity of the passage or its meaning regardless of the use of either term by Tacitus. Pilate's rank while he was governor of Judaea appeared in a Latin inscription on the Pilate Stone which called him a prefect, while this Tacitean passage calls him a procurator. Josephus refers to Pilate with the generic Greek term ἡγεμών, hēgemōn, or governor. Tacitus records that Claudius was the ruler who gave procurators governing power. After Herod Agrippa's death in AD 44, when Judea reverted to direct Roman rule, Claudius gave procurators control over Judea. Various theories have been put forward to explain why Tacitus should use the term "procurator" when the archaeological evidence indicates that Pilate was a prefect. Jerry Vardaman theorizes that Pilate's title was changed during his stay in Judea and that the Pilate Stone dates from the early years of his administration. Baruch Lifshitz postulates that the inscription would originally have mentioned the title of "procurator" along with "prefect". L.A. Yelnitsky argues that the use of "procurator" in Annals 15.44.3 is a Christian interpolation. S.G.F. Brandon suggests that there is no real difference between the two ranks. John Dominic Crossan states that Tacitus "retrojected" the title procurator which was in use at the time of Claudius back onto Pilate who was called prefect in his own time. Bruce Chilton and Craig Evans as well as Van Voorst state that Tacitus apparently used the title procurator because it was more common at the time of his writing and that this variation in the use of the title should not be taken as evidence to doubt the correctness of the information Tacitus provides. Warren Carter states that, as the term "prefect" has a military connotation, while "procurator" is civilian, the use of either term may be appropriate for governors who have a range of military, administrative and fiscal responsibilities. Louis Feldman says that Philo (who died AD 50) and Josephus also use the term procurator for Pilate. It should be noted that, as both Philo and Josephus wrote in Greek, neither of them actually used the term "procurator", but the Greek word ἐπίτροπος (epitropos), which is regularly translated as "procurator". Philo also uses this Greek term for the governors of Egypt (a prefect), of Asia (a proconsul) and Syria (a legate). Werner Eck, in his list of terms for governors of Judea found in the works of Josephus, shows that, while in the early work, The Jewish War, Josephus uses epitropos less consistently, the first governor to be referred to by the term in Antiquities of the Jews was Cuspius Fadus, (who was in office AD 44-46). Feldman notes that Philo, Josephus and Tacitus may have anachronistically confused the timing of the titles – prefect later changing to procurator. Feldman also notes that the use of the titles may not have been rigid, for Josephus refers to Cuspius Fadus both as "prefect" and "procurator". 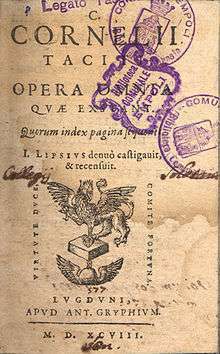 The title page of 1598 edition of the works of Tacitus, kept in Empoli, Italy. Most modern scholars consider the passage to be authentic. William L. Portier has stated that the consistency in the references by Tacitus, Josephus and the letters to Emperor Trajan by Pliny the Younger reaffirm the validity of all three accounts. Scholars generally consider Tacitus's reference to be of historical value as an independent Roman source about early Christianity that is in unison with other historical records. Tacitus was a patriotic Roman senator. His writings show no sympathy towards Christians, or knowledge of who their leader was. His characterization of "Christian abominations" may have been based on the rumors in Rome that during the Eucharist rituals Christians ate the body and drank the blood of their God, interpreting the ritual as cannibalism by Christians. Andreas Köstenberger states that the tone of the passage towards Christians is far too negative to have been authored by a Christian scribe. Van Voorst also states that the passage is unlikely to be a Christian forgery because of the pejorative language used to describe Christianity. Tacitus was about 7 years old at the time of the Great Fire of Rome, and like other Romans as he grew up he would have most likely heard about the fire that destroyed most of the city, and Nero's accusations against Christians. When he wrote his account, Tacitus was the governor of the province of Asia, and as a member of the inner circle in Rome he would have known of the official position with respect to the fire and the Christians. In 1885 P. Hochart had proposed that the passage was a pious fraud, but the editor of the 1907 Oxford edition dismissed his suggestion and treated the passage as genuine. Scholars such as Bruce Chilton, Craig Evans, Paul R. Eddy and Gregory A. Boyd agree with John Meier's statement that "Despite some feeble attempts to show that this text is a Christian interpolation in Tacitus, the passage is obviously genuine.” However, Richard Carrier argues that the phrase "Their founder, one Christ, had been put to death by the procurator, Pontius Pilate in the reign of Tiberius" in the passage is a Christian interpolation. He argues that even if the phrase is totally genuine, it is likely that Tacitus is merely repeating what Christians believed. Carrier also argues that there is a strange gap in the Annals of Tacitus for the period of middle 29 to middle 31 and cites Robert Drews' suggestion that the period was cut because it provided no information regarding Jesus. Suggestions that the whole of Annals may have been a forgery have also been generally rejected by scholars. John P. Meier states that there is no historical or archaeological evidence to support the argument that a scribe may have introduced the passage into the text. Portrait of Tacitus, based on an antique bust. Van Voorst states that "of all Roman writers, Tacitus gives us the most precise information about Christ". John Dominic Crossan considers the passage important in establishing that Jesus existed and was crucified, and states: "That he was crucified is as sure as anything historical can ever be, since both Josephus and Tacitus... agree with the Christian accounts on at least that basic fact." Eddy and Boyd state that it is now "firmly established" that Tacitus provides a non-Christian confirmation of the crucifixion of Jesus. Biblical scholar Bart D. Ehrman wrote: "Tacitus's report confirms what we know from other sources, that Jesus was executed by order of the Roman governor of Judea, Pontius Pilate, sometime during Tiberius's reign." James D. G. Dunn considers the passage as useful in establishing facts about early Christians, e.g. that there was a sizable number of Christians in Rome around AD 60. Dunn states that Tacitus seems to be under the impression that Christians were some form of Judaism, although distinguished from them. Raymond E. Brown and John P. Meier state that in addition to establishing that there was a large body of Christians in Rome, the Tacitus passage provides two other important pieces of historical information, namely that by around AD 60 it was possible to distinguish between Christians and Jews in Rome and that even pagans made a connection between Christianity in Rome and its origin in Judea. Although the majority of scholars consider it to be genuine, a few scholars question the authenticity of the passage given that Tacitus was born 25 years after Jesus' death. Some scholars have debated the historical value of the passage given that Tacitus does not reveal the source of his information. Gerd Theissen and Annette Merz argue that Tacitus at times had drawn on earlier historical works now lost to us, and he may have used official sources from a Roman archive in this case; however, if Tacitus had been copying from an official source, some scholars would expect him to have labeled Pilate correctly as a prefect rather than a procurator. Theissen and Merz state that Tacitus gives us a description of widespread prejudices about Christianity and a few precise details about "Christus" and Christianity, the source of which remains unclear. However, Paul R. Eddy has stated that given his position as a senator Tacitus was also likely to have had access to official Roman documents of the time and did not need other sources. Michael Martin notes that the authenticity of this passage of the Annals has also been disputed on the grounds that Tacitus would not have used the word “messiah” in an authentic Roman document. Weaver notes that Tacitus spoke of the persecution of Christians, but no other Christian author wrote of this persecution for a hundred years. Hotema notes that this passage was not quoted by any Church father up to the 15th century, although the passage would have been very useful to them in their work; and that the passage refers to the Christians in Rome being a multitude, while at that time the Christian congregation in Rome would actually have been very small. Scholars have also debated the issue of hearsay in the reference by Tacitus. Charles Guignebert argued that "So long as there is that possibility [that Tacitus is merely echoing what Christians themselves were saying], the passage remains quite worthless". R. T. France states that the Tacitus passage is at best just Tacitus repeating what he had heard through Christians. However, Paul R. Eddy has stated that as Rome's preeminent historian, Tacitus was generally known for checking his sources and was not in the habit of reporting gossip. Tacitus was a member of the Quindecimviri sacris faciundis, a council of priests whose duty it was to supervise foreign religious cults in Rome, which as Van Voorst points out, makes it reasonable to suppose that he would have acquired knowledge of Christian origins through his work with that body. 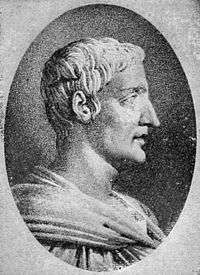 Tacitus is one of three key Roman authors who may refer to early Christians, the other two being Pliny the Younger and Suetonius. These authors refer to events which took place during the reign of various Roman emperors, Suetonius writing about an expulsion from Rome during the reign of Claudius (41 to 54), and also punishments by Nero (who reigned from 54 to 68), Pliny's letters are to Trajan about the trials he was holding for Christians around 111 AD. But the temporal order for the documents begins with Pliny writing around 111 AD, then Tacitus around 115/116 AD and then Suetonius writing in the Lives of the Twelve Caesars around 122 AD. Thus 47 to 58 years after the 64 AD fire and Nero's alleged persecution. 1 2 Newton, Francis, The Scriptorium and Library at Monte Cassino, 1058–1105, ISBN 0-521-58395-0 Cambridge University Press, 1999. "The Date of the Medicean Tacitus (Flor. Laur. 68.2)", p. 96-97. ↑ J. Boman, Inpulsore Cherestro? Suetonius’ Divus Claudius 25.4 in Sources and Manuscripts, Liber Annuus 61 (2011), ISSN 0081-8933, Studium Biblicum Franciscanum, Jerusalem 2012, p. 355, n. 2. ↑ Tacitus, Annals 12.60: Claudius said that the judgments of his procurators had the same efficacy as those judgments he made. ↑ P. A. Brunt, Roman imperial themes, Oxford University Press, 1990, ISBN 0-19-814476-8, ISBN 978-0-19-814476-2. p.167. ↑ Geoffrey W. Bromiley, The International Standard Bible Encyclopedia, Wm. B. Eerdmans Publishing, 1988. ISBN 0-8028-3785-9, ISBN 978-0-8028-3785-1. p.979, col.1. ↑ "A New Inscription Which Mentions Pilate as 'Prefect'", JBL 81/1 (1962), p.71. ↑ "Inscriptions latines de Cesaree (Caesarea Palaestinae)" in Latomus 22 (1963), pp.783-784. ↑ "The Caesarea Inscription of Pontius Pilate and Its Historical Significance" in Vestnik Drevnej Istorii 93 (1965), pp.142-146. ↑ Birth of Christianity by John Dominic Crossan (Apr 1, 1999) ISBN 0567086682 T & T Clark p.9. ↑ Robert E. Van Voorst, Jesus Outside the New Testament: An Introduction to the Ancient Evidence, Wm. B. Eerdmans, 2000. p.48. ↑ Matthew and Empire: Initial Explorations by Warren Carter (T&T Clark: October 10, 2001) ISBN 978-1563383427 p.215. ↑ Werner Eck, "Die Benennung von römischen Amtsträgern und politisch-militärisch-administrativenFunktionen bei Flavius Iosephus: Probleme der korrekten IdentifizierungAuthor" in Zeitschrift für Papyrologie und Epigraphik, 166 (2008), p.222. ↑ Henry Furneaux, ed., Cornelii Taciti Annalium ab excessu divi augusti libri. The annals of Tacitus with introduction and notes, 2nd ed., vol. ii, books xi-xvi. Clarendon, 1907. Appendix II, p. 416f." ↑ Henry Furneaux, ed., Cornelii Taciti Annalium ab excessu divi augusti libri. The annals of Tacitus with introduction and notes, 2nd ed., vol. ii, books xi-xvi. Clarendon, 1907. Appendix II, p. 418. ↑ Meier, John P., A Marginal Jew: Rethinking the Historical Jesus, Doubleday: 1991. vol 1: p. 168-171. ↑ Ehrman, Bart D. (2001). Jesus: Apocalyptic Prophet of the New Millennium. Oxford University Press. p. 59. ISBN 978-0195124743. ↑ Theissen, Gerd; Merz, Annette (1998). The historical Jesus: a comprehensive guide. Minneapolis: Fortress Press. p. 83. ISBN 978-0-8006-3122-2. ↑ France, RT (1986). Evidence for Jesus (Jesus Library). Trafalgar Square Publishing. pp. 19–20. ISBN 0-340-38172-8. ↑ Van Voorst, Robert E. (2011). Handbook for the Study of the Historical Jesus. Brill Academic Pub. p. 2159. ISBN 978-9004163720.